This is a great cereal. It has a classic vibe like it's been around since the early 1970's. This is a Frosted Mini-Wheat that was meant-to-be. Original Frosted Mini-Wheats debuted nationally in 1970. Since then, there have been many new flavors of Mini-Wheats. Some were great taste successes like Maple & Brown Sugar. Others felt like Kellogg's was just chucking in flavors to get attention as with Strawberry Delight. Why do some flavors work and other don't? To make a human analogy: If you were to wear a hat, your appearance would change. People you meet might form an opinion of you because of it. However, your friends know who you are with or without your hat. Now if you go to the gym and beef up or start volunteering for charity work, those that know you best will see a real change in your character. In the world of Mini-Wheats, strawberries and raisins (Mini-Wheats Raisin) feel like hats. Hats can be fun. The magic of this new cereal (and to slightly lesser degree Maple & Brown Sugar Mini-Wheats) is that it's not just Mini-Wheats with sparkle and pizzazz. It's a cereal who's very heart and soul has made a transformation. If Original Mini-Wheats were introduced in 1970 with this new flavor, the product line would still be as strong and as varied as it is today. The box tells us that this new cereal has "Rich Streusel Flavor... The Taste of Frosted Cinnamon... Baked Into Every Bite". This descriptions doesn't quite capture the real essence. I'd be more inclined to say, "Frosted Mini-Wheats have just been kissed with a unique creamy, cinnamon goodness. It's not the kind of kiss that leaves a lipstick smear of cinnamon, but rather the other kind... a smooch that leaves behind a cinnamon smile." One word of warning: This isn't the best cereal for dry-snacking. It requires milk to smooth out and integrate the flavors. If you like Frosted Mini-Wheats and you like cinnamon, I urge you to give this new cereal a try. *The price paid reflects a two (16-ounce boxes) for $5.00 sale. 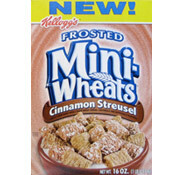 What do you think of Cinnamon Streusel Frosted Mini-Wheats? I can't find this cereal anymore. Only their new Cinnamon Bun version which pales in comparison. I love this cereal! It's the only cereal I eat. However, I all of a sudden can't find it on the shelves of any store (grocery or wholesale)! Can you tell me why? I miss it!!!! I'm seconding GNJ and Jimbo. The non-frosted but raisin filled mini-wheats were amazing. I can't find them anywhere. Yes, I Google'd this cereal because I love it so much. Cinnamon is just that kind of flavor that WORKS with almost anything, and pairing it with Frosted Mini-Wheats was just a match made in heaven. I didn't think they could do much to Frosted Mini-Wheats to make them better (I liked them, but they were just "good" in my book - nothing special), but now that this flavor has come out, it has quickly become my new favorite. Oh, and also, I have to disagree with the review just a little - I love snacking on this cereal without milk! Maybe it's just me, but I think it tastes great! If you haven't tried this new flavor, you definitely should give it some thought. The Mini-Wheats with Raisins was the only one of these cereals that I enjoyed and I LOVED it!! Why can't they bring it back? It was perfect with just the right amount of flavor and not too sweet (like the sickeningly sugary frosted kind). Why can't cereal makers get over the incredible sugar addiction - I am so sick of piles of sugar in my cereal. WAKE UP people - sugar is bad for you and sugar substitutes are just as bad. Bring back the raisins!!! Whatever happened to the Mini-Wheats Raisin variety of this cereal. I've not been able to find it in stores for a year or two? I want to know what song they copied their little tune from!!! I NEED IT... ITS A NATIONAL EMERGENCY!!! I also hear the scent of menstrual sauce, I was planning on making a appointment with the hearing doctor!!! I would like to know where i can find the lyrics to the cinnamon streusel mini wheats song or if anyone knows them. I just love the commercial and the song always gets stuck in my head I LOVE IT. 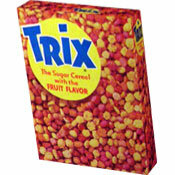 I hated this cereal. We tried the blueberry and it was fantastic. Then we bought a huge 2 bag box at Sam's Club. Its going to go to waste. No one in the house could stomach it. Sorry. The song is very catchy. It''s one of those songs that are fun and you catch yourself singing and tapping your feet to - EXCEPT - I am soooo glad to know that I am not the only one who also clearly hears "cinn-a-menstrual sauce" or "scent of menstrual sauce". It doesn''t matter if I hear it on the radio or tv....no matter how hard I try, that is all I hear. Probably not a great song choice for this product - except - the song has made me remember the product with a chuckle. I heard "scent of menstrual sauce"
The commercial for this cereal is horrible. When the song is on, instead of hearing "cinnamon-streusel", I hear Cinna-Menstrual sauce. That's just bad advertising. Sure these taste great, but did you know all the Mini Wheats except the frosted and obviously un-frosted have sorbital as one of the main sweenters. Did you know that sorbital also works as a laxative (and can really jazz up some digestive systems)? Can you tell me why they'd put this in the cereal????? The only reason I can think is to keep the sugar content down while making the cerael as sweet as they wanted. I wrote Kellogg's and asked them about this and they sent me a coupon for more cereal. Anyway...just wanted to put that warning out there for anyone with a sensative stomach. Too sweet for my tastes. I would like to knopw this cereal's Calories, fat and sugars contents, please. E.